Failure simply put neglect to do the right thing at right time. Failure also is the postponement of what is needed to be done now, the inability to responds to responsibility and lack of vision to see the end result of work. Failure Is Not Lack Of Fat Bank Account. Failure Is Not Lack Of Family Success. Failure Is Not Lack Promotion At Work. Failure is placing comfort over responsibility. Failure is neglect of responsibility. Failure is knowing what to do, when to do and how to do it, but refuse to take responsibility. 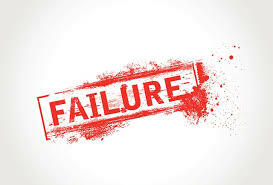 Failure Therefore, Is Your Refusal To Do What You Have The Capacity To Do. It is very hard to do, nobody has done it, nobody can do it, it is impossible Mr. Failure said. He will never see what is possible. A Failure is a person that is beclouded by reasons not to do anything because of his foolishness to see the opportunity ahead. He lives under the atmosphere of impossibilities and always overwhelm with adequate reasons not to succeed. Failure Is Deceitful, You Can’t See The Effect On The Day That You Enroll Into Her College, But The Consequences Will Accumulate And Grow To A Point That Will Be Out Of Your Control And Capacity To Contain. Lack Of Effective Communication In Family Might Cost You Family Breakup. Lack Of Spirituality Can Make You Become A Victim Of Circumstances, And Expose You To The Attack Of The Enemy. Lack Of Eating Right And Burn Some Calories At The Right Time Will Cost You Good Health. Lack Of Financial Planning Will Cost You Good Life And Make You Live A Life Of Distress. Let everybody refuse to communicate with their family, don’t let it be you. Let everybody refuse to standup and do the needful, don’t let it to be you. Let everybody live a careless life, don’t let it to be you. Failure is everyday, but the end result is what you see after one weeks, months and years and at the end of your life. Trust in others or expecting from people is the highway to failure. Nobody is sufficient everybody is in need. Trust God and workout your believe then expect the miracle from the universe. This entry was posted in Life and Time Management, Self Development, Spirituality, The Secret, Vitamin Of The Mind, You! and tagged Failure, How to be successful, How To Refuse Failure, how to succeed, Jim Rohn, Rotimi Adedokun, success. Bookmark the permalink.